My youngest son-in-law was competing in a triathlon that would last for most of the day. This was definitely, no place for young babies to be, with the roaring heat upon us. So, this gave Grammie her “First Date” with the little man! All alone…just the two of us! Be still my heart!!!! 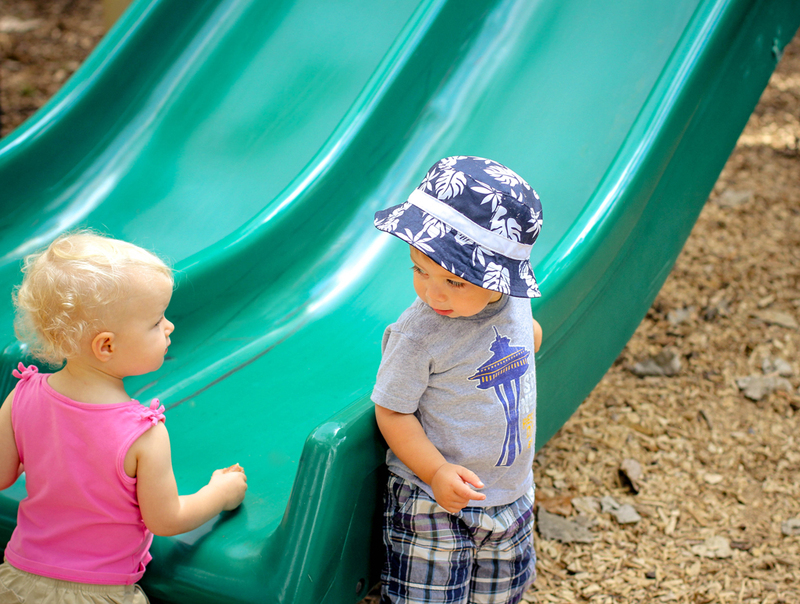 I decided, our first date would be at the local playground…something we would both enjoy. He met new friends immediately! Everybody wanted to be around him…he was like a magnet. Did you notice his shirt? I bought it in Seattle when I was at the Space Needle…recognize it? He found a way to get away from the camera…run under the tunnel! Grammie can’t fit through here. Okay, maybe this wasn’t just going to be a date for me and him only…smile! The girls loved him and I think it was very mutual. 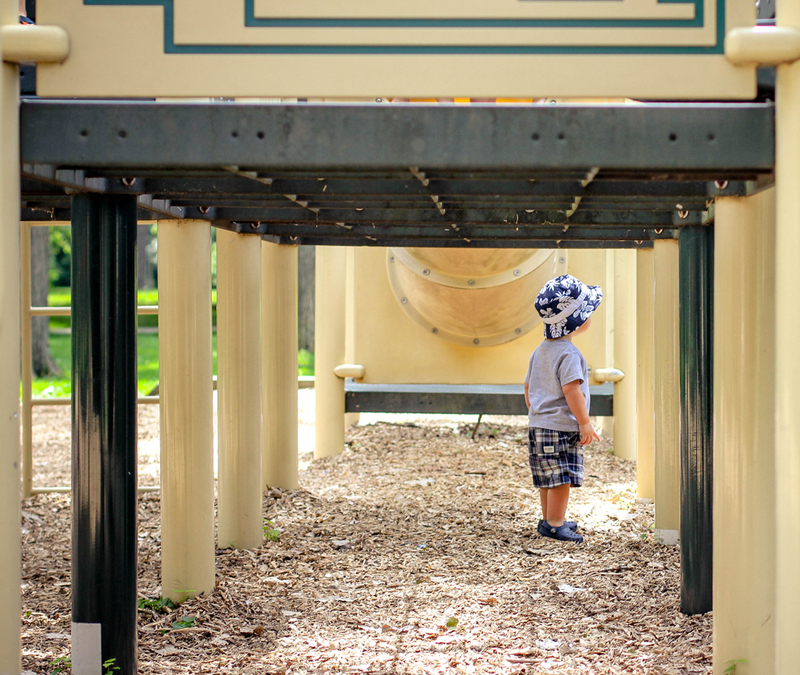 After he played and played on the playground…we decided it was time to leave. On the way home, we went to McDonald’s drive-through and bought a dipped ice cream cone to finish the afternoon. By the time he licked the last drop, sitting in his car seat…his little eyelids closed and that was the end of our first date. We sure hope you are enjoying the posts here at Pride in Photos. If you are gathering a smile or two, won’t you spread the word of our blog to your family and friends? And D is for a darling little sweetie. Just too cute. He is so so adorable. I love his eyes and of course the hat! Awww… darling cuties! So beautifully captured! Great pictures. Glad you got to spend some quality time with Nolan. What a cutie! I can see why he’s a magnet! Her paintings have earned many likes because they are so beautiful. Have my older articles found themselves in reader myself? Let work on the images and then choose with liken. I can write Yes, that you for an article in English what I’ve written if you want. Have fun on my blog. Wish you a beautiful Friday. And thank you for visiting nice. So sweet for Grammie and Little Man! Sounds like a fun date. He is too precious, and I can see why he is such a lady magnet! Oh, he is so cute in that hat! Again, such beautiful images! What a fun day!! He is precious… As are the other children. So cute and so fun! 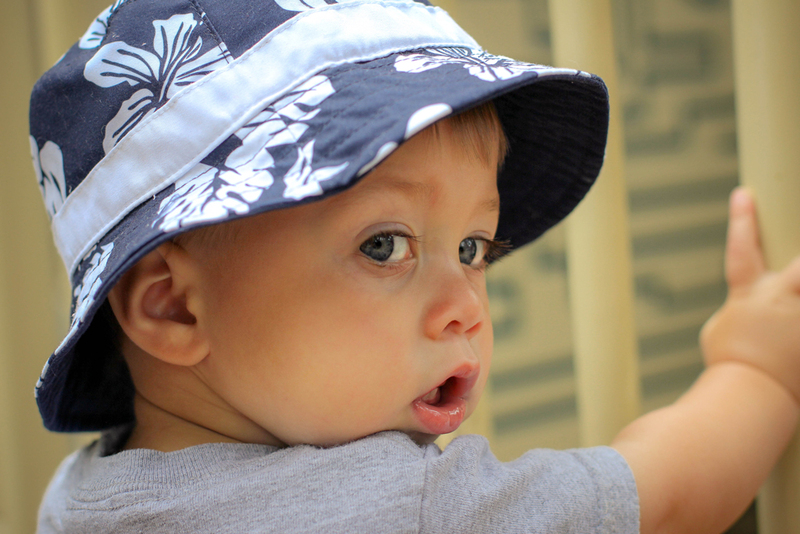 I love little bucket hats on toddlers! Your images are fabulous and I love his little outfit – so stylin’! 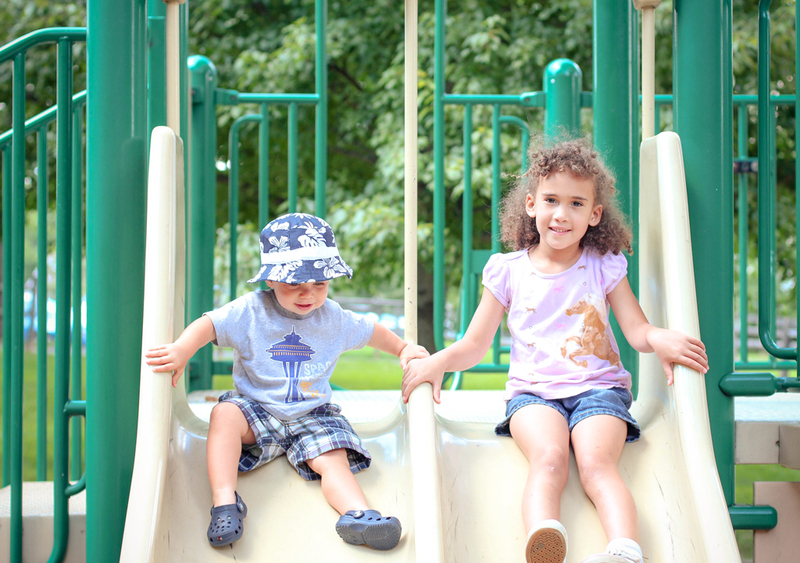 I agree that there’s little better than capturing kids you love at play at the park! What a precious, precious first date. Adorable. Love the continuation of the fun with your grandson, Laurie! Looked like a beautiful day for a play-date! If I haven’t said it before, he is absolutely adorable!! So how did your son-in-law do in the triathlon? Love the hat shots, such beautiful eyes and such sharo photos! Laurie – I’m sure he will have plenty of dates in the future!!!! What a special treat to have such a fun day with your grandson….He is beautiful and your shots a treasure…. Love his hat! The picture of him looking back over his shoulder needs to be framed and put on the wall or a desk some where. I laughed at my reaction at your comment, it had me scrambling to go see which photo you were talking about to frame. LOL! Thank you. I am sorry, I meant the second picture from the top. What a lovely date! Very sweet! I especially like the little droplet on his lip. You have one cutie patootie there, Grandma. It’s so cute! Really you had a nice day with your grandson! Lovely pics! Oh this is adorable, Laurie! You made me miss my gandma all of a sudden. Oh – fun with Gammie! 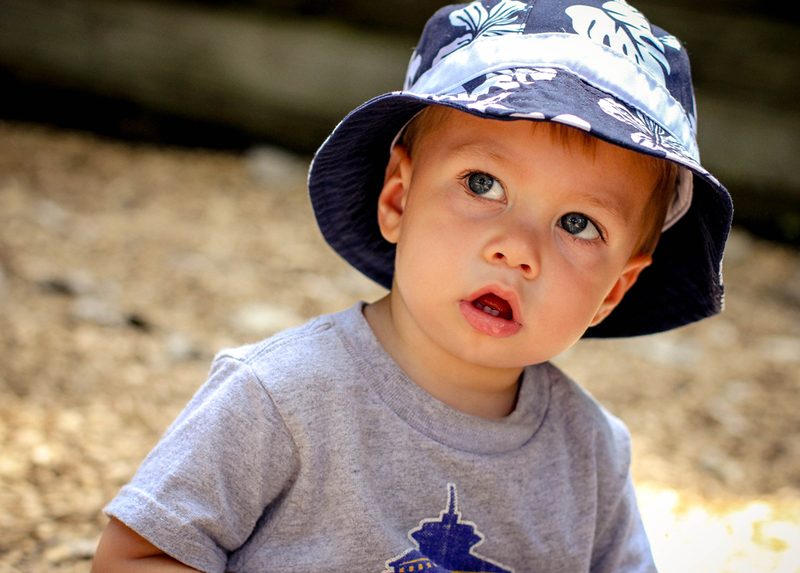 Adorable – makes me miss my sons when they were this age….why do they grow up so fast? Good luck to your son-in-law! Wow, so cute!!! Wonderful shots!!! man is he cute!!! and of course I love your photos Laurie. They are just wonderful! You’re building precious moments to store in images and thought. How fun!!! Quite a handsome date you have there. How fun to spend a day with your adorably little guy 🙂 Thanks for sharing these cute pics, Laurie! OMG! He is going to be a lady killer when he grows up! Darling boy and Delighful photos. Most adorable pics! Apart from a thinker, he’s a charmer too! Adorable photographs, love them all! My favorite one was under the tunnel. What a little cuties! Lovely day. Lovely pics. He is just so adorable! You made me smile and think of my grandsons… they are 3 and 7. I’m having them this Saturday and I love every minute of that 1 on 1 time. It is always so nice to see another grandma here and hear about the love of their grandchildren too…thanks for visiting today. What a little knock-out, and such a fashion statement! 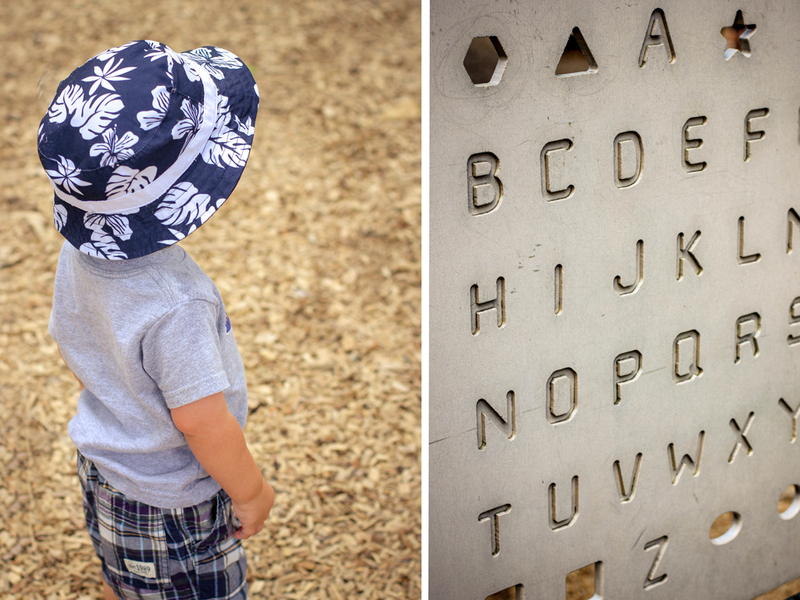 It’s a neat idea, the concrete wall with the alphabet at the playground. I haven’t seen that before, mind you I haven’t been to a playground in an awful long time. My favourite was always the merry-go-round but apparently it’s been removed for safety reasons.